Indonesian migrant worker Ruyati binti Sapubi was beheaded in Mecca on this date in 2011 for the meat cleaver murder of her mistress. She numbered among the several hundred thousand Indonesian women hired as domestic servants in the Gulf kingdom. “The maid carried out the killing after she was denied permission to leave the kingdom and return to her family in Indonesia, according to officials in Jakarta,” according to press reports on the very sketchy details allowed by Riyadh. Indeed, just days after the execution, word leaked of a Sri Lankan domestic who had been secretly held in outright slavery for 14 years. Mature Content: The execution was secretly recorded. This is a snuff film. The Indonesian government slapped an immediate moratorium on overseas work in Saudi Arabia in the aftermath of this horror. Unfortunately, these and similar measures in the 2010s have only compounded the risk of trafficking, increasing the vulnerability of people desperate to secure work abroad. 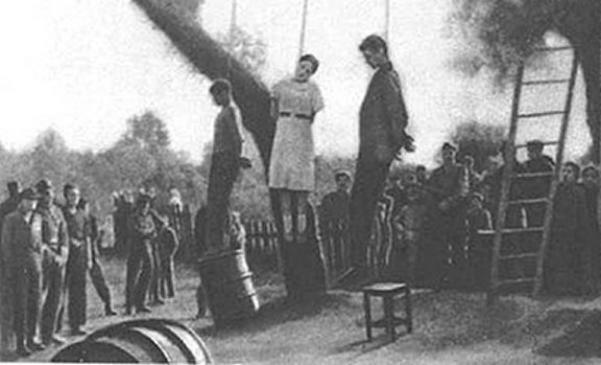 Soviet resistance operatives Maria Kislyak, Fedor Roudenko and Vasily Bougrimenko hanged on this date in 1943 by Nazi occupation. Kislyak, an 18-year-old from Kharkov, Ukraine who is esteemed a Hero of the Soviet Union,* is the best-known of them and made herself the poisoned honey in a trap for German officers. As ferocious Eastern Front fighting raged near her city, Kislyak feigned affection for a German lieutenant and thereby lured him to a woodland rendezvous where her friend Roudenko ambushed him and bludgeoned him to death. Kislyak endured German torture without admitting anything and was even released since the man’s comrades couldn’t be sure that the local flirt had anything to do with the murder. But when she and her friends pulled the trick a second time, the Germans forced the assassins to reveal themselves by threatening to shoot random hostages en masse. 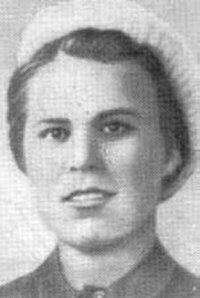 * One of three women so honored for their service during World War II, all of whom have been featured in these grim annals; the others are Klava Nazarova and Zoya Kosmodemyanskaya. 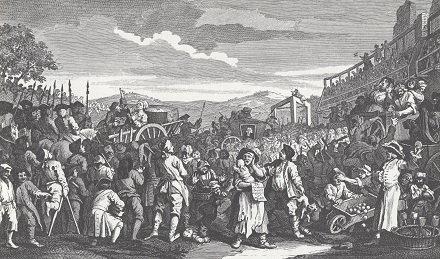 On this date in 1759, Catharine Knowland became the last fruit of the Tyburn Tree. Dating to the Elizabethan age, the triangular triple gallows had long secured its place in death penalty iconography. Over the years its sturdy limbs ushered to the hereafter London’s most hated criminals and her most beloved; dashing outlaws; steely regicides; holy martyrs — in ones and twos, or in heavy crops of up to 24. By the time of the Bloody Code, what had once been an outlying village was being absorbed into the city, and as we come to our scene in the mid-18th century was a place of rising respectability decreasingly at home with the sordid task appointed to it — and with the disorderly revel thereby invited. Neighbors were pushing to send away the gallows. 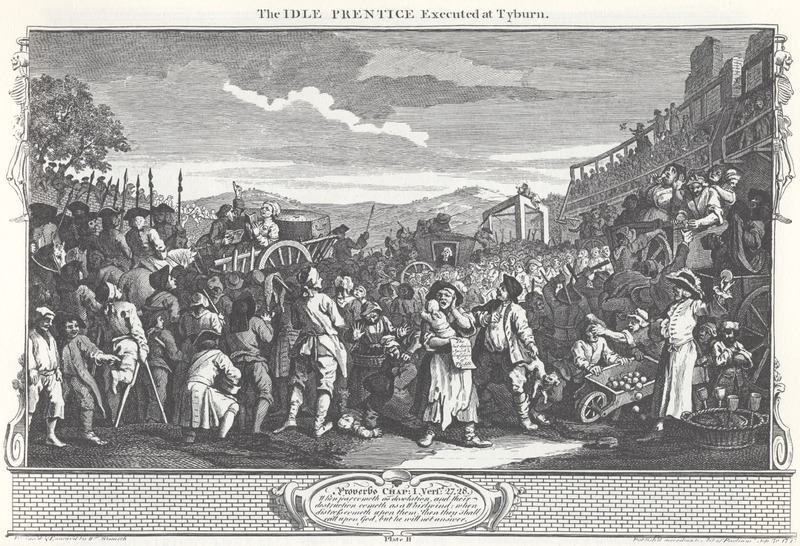 William Hogarth, Industry and Idleness, Plate 11; The Idle Prentice Executed at Tyburn (1747). 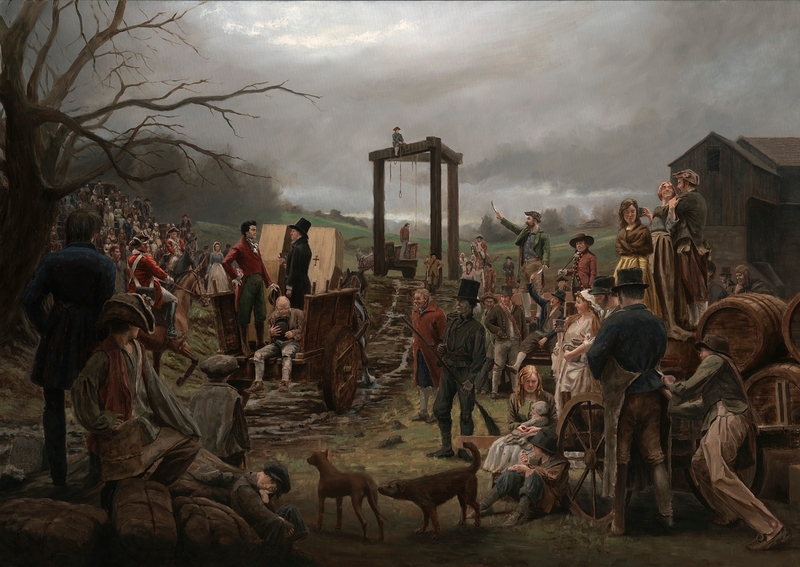 The execution itself is barely visible, swallowed up in a disordered throng. 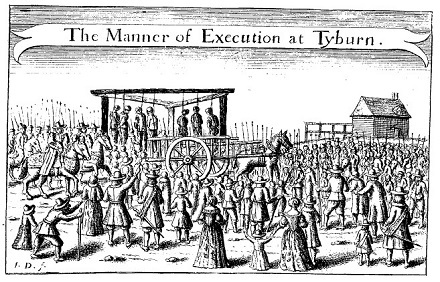 In little more than a generation’s time, public executions would indeed be removed from Tyburn altogether. But the tree itself did not quite make it to the end of Tyburn’s famous run. bid me stop, and asked me where I was going; I said, what is that to you; she took hold on the skirt of my coat, and catch’d hold of my watch and pull’d it from my pocket; I made a struggle with her; then up came a man and said, You scoundrel dog, what business have you with my wife, and down he knock’d me; I was sensible and got up directly and pursued her. The watch was worth 40 shillings, which meant it was worth a thief’s life. 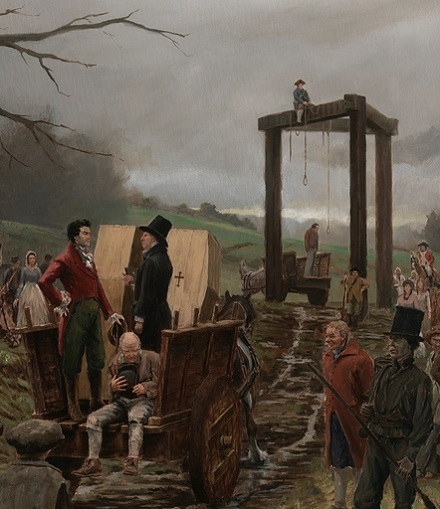 By that summer, beams and posts alike had been demolished — replaced by a smaller, portable structure, to begin public hangings’ a century-long shrinkage from the raucous mobs under the Tyburn Tree until the spectacle at last vanished behind prison walls altogether. On this date in 1862, seven federal raiders were hanged in Atlanta for the daring heist of a Confederate train two months prior. 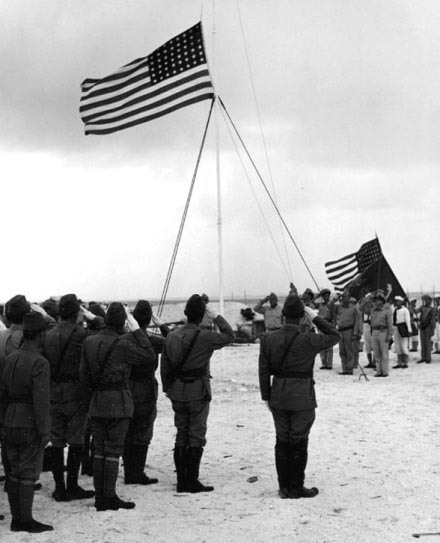 Among them were some of the very first Congressional Medal of Honor awardees. In terms of its impact on the Civil War, the “Great Locomotive Chase” was a bust. But as pure Americana, you’ll have a hard job to top this caper. The chase began a year to the day after the first shots had been fired between North and South. Despite the anniversary, the occasion promised nothing but the routine northbound passenger run for the locomotive General from Atlanta to Chattanooga, Tenn. This line was a spur of the Confederate rail network, and we have already noted in these pages the interest that network held for pro-Union saboteurs. Chattanooga was its great hub: telegraph and rail lines from every quarter of the Confederacy converged there like the center of a spiderweb. For this reason, Union Gen. Ormsby Mitchel, who had just occupied Huntsville, Ala., aspired to swing his army north to strike this vital city. His bold commandos nonchalantly boarding the northbound train this day were part of Mitchel’s larger operation: cut the rail line from Atlanta to prevent timely reinforcement of Chattanooga, then quickly conquer the strategic city. * Gen. Mitchel was 28 miles from Chattanooga on April 12, 1862, and if his special agents could turn their trick then the whole course of the war might change. Not long after 5 a.m. on that April 12, the General pulled into a depot at Big Shanty (today, Kennesaw, Ga.). It had a short layover there for breakfast at the adacent Lacey Hotel. But more important to the raiders’ leader James J. Andrews was what Big Shanty did not have: a telegraph. While the train’s passengers and crew were settling in for the most important meal of the day, Andrews’s raiders efficiently decoupled the locomotive, its coal tender, and three box cars from the passenger cars. 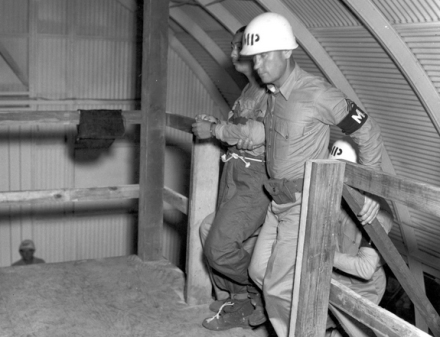 Most of the raiders loaded into the boxcars to be ready as muscle for the crazy flight ahead. But the day was to be a match of speed and ingenuity between the Union daredevil Andrews, and the Confederate train conductor William Fuller — who for the start could only watch in astonishment over his coffee as his General unexpectedly pulled away. With no telegraph in the vicinity, Fuller had no way to send word up the line to stop the General. But umbrage either patriotic or professional carried him from that first moment in a Javert-like pursuit of his commandeered locomotive. Fuller dashed out of Big Shanty and up the train tracks on foot with his team. It’s not as crazy as it sounds: negotiating hilly terrain, the General would be making only 15 or 20 miles per hour at speed — and she stopped regularly, to foul the rails behind her, and to cut the telegraph wire. Throughout the chase, or at least until its very last stretch, the Union men managed to keep the next station ahead ignorant of the General‘s treasonable mission by snipping telegraph wire, so on the occasions when they had to stop and answer to a Western & Atlantic Railroad official they were able to bluff their way onward with a story about driving a “powder train” requisitioned by General Beauregard himself. But those stops took time, and Fuller’s dogged pursuit did not leave Andrews’s raiders much of that to spare. A couple of miles up the line, Fuller et al found an old handcar, and were able to take to the rails themselves. Near 20 miles into the chase, they were able to commandeer a short-line locomotive, which took them to Kingston where they switched to a mail train. Neither of these vehicles could match the General‘s horsepower; however, Andrews had to keep stopping to cut more telegraph wires or to pry up a rail, and he really got pegged back when the General had to defer to other rail traffic on the single-line route. For instance, the Union commandos spent a frustrating hour on the siding at Kingston waiting out southbound trains. Andrews’s party did not know for sure at this point that there was a pursuer making good use of this hour. But even so, they had a challenge to spend the scarce resource of time with their hijacked locomotive to best effect. The objective of the raid was to wreck the Atlanta-Chattanooga rail line, in a way that would put it out of commission for many days and give Gen. Mitchel leave to overwhelm Chattanooga — something like firing a bridge or collapsing a tunnel. The stops they made as they passed various stations to cut the telegraphs or laboriously crowbar up a bit of the rail were essential to give them the ability to cover the next few miles, and bluff past the next station. But thanks to Fuller’s pursuit, there was not after these time-consuming little acts of sabotage a sufficient opportunity to accomplish the tactical purpose of the hijacking. An extensive collection of links and images relating to the entire route of the chase is here. In the coolest final stage, the segment most properly called the “Great Locomotive Chase”, Fuller’s gang grabbed a southbound locomotive, the Texas, and without bothering to turn it around they slammed it into reverse in hot pursuit of the northbound General. The federals in the General tried dropping timbers, and even cutting loose boxcars behind them as railbound battering rams aimed at their inexorable hunter. The Texas kept coming. By the time the Union boys reached a wooden covered bridge over the Oostanaula, it was apparent that the locomotive would soon exhaust her fuel. Still, the churning plumes of the backward Texas loomed just a few minutes behind. In his last chance to do what he had set out for, Andrews torched his final remaining box car and released it into the wooden bridge, hoping to set the entire structure ablaze and collapse it into the river. Unhappily for the General‘s illicit crew, looking backwards with desperate hope as their ride chugged off, boards sodden by a week’s worth of springtime rain showers stubbornly refused to kindle … and then the Texas arrived to clear away the incendiary. As its fuel dwindled and its adversary closed, the General came to the end of her legendary run about 18 miles from Chattanooga. Andrews and party abandoned their engine to history and scattered into the woods — but none escaped the immediate Confederate manhunt. The twenty raiders, plus two others who were supposed to be part of the operation but missed their rendezvous, were all court-martialed as spies: “lurking in and around Confederate camps as spies, for the purpose of obtaining information,” a description bearing very scant resemblance to their actual activities. Eight would hang on this basis. 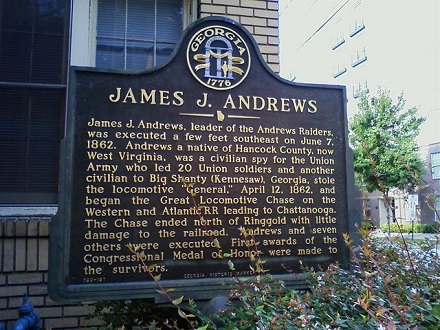 The intrepid ringleader James Andrews, who was a civilian, was executed in Atlanta on June 7, all alone. His mates only learned of his fate while sitting at their trial in Chattanooga — an experience described in a memoir by one of their number, William Pittenger. As the trial of different ones proceeded, we had still greater encouragement from the court itself. Members called on us, and told us to keep in good heart, as there was no evidence before them to convict any one. This cheered us somewhat, but there was still one thing which I did not like, and which looked as if something was wrong. The court would not let our boys be present to hear the pleading of counsel on either side, though they urgently requested it. They could neither hear what our lawyers had to say for them, nor what the Judge Advocate urged against them. The trials proceeded rapidly. One man was taken out each day, and in about an hour returned. The table in the court room was covered with bottles, newspapers, and novels, and the court passed its time during trial in discussing these. This was very well if the trial was, as they said, a mere matter of formality; but if it was a trial in earnest, on which depended issues of life or death, it was most heartless conduct. At last the number of seven was reached, and they would probably have proceeded in trying others, had not General Mitchel, who was continually troubling them, now advanced, and shelled Chattanooga from the opposite side of the Tennessee river. This at once broke up the court-martial, and sent the officers in hot haste to their regiments to resist his progress. Soon after, General Morgan advanced through Cumberland Gap, and threatened Knoxville, which also rendered it necessary to remove us. One day while we were very merry, amusing ourselves with games and stories, we saw a squadron of cavalry approaching. This did not at first excite any attention, for it was a common thing to see bodies of horsemen in the streets; but soon we observed them halt at our gate, and surround the prison. What could this mean? A moment after, the clink of the officers’ swords was heard as they ascended the stairway, and we knew that something unusual was about to take place. They paused at our door, threw it open, called the names of our seven companions, and took them out to the room opposite, putting the Tennesseeans in with us. One of our boys, named Robinson, was sick of a fever, and had to be raised to his feet, and supported out of the room. With throbbing hearts we asked one another the meaning of these strange proceedings. Some supposed they were to receive their acquittal; others, still more sanguine, believed they were taken out of the room to be paroled, preparatory to an exchange. I was sick, too, but rose to my feet, oppressed with a nameless fear. A half crazy Kentuckian, who was with the Tennesseeans, came to me and wanted to play a game of cards. I struck the greasy pack out of his hands, and bade him leave me. A moment after, the door opened, and George D. Wilson entered, his step firm and his form erect, but his countenance pale as death. Some one asked a solution of the dreadful mystery, in a whisper, for his face silenced every one. “We are to be executed immediately,” was the awful reply, whispered with thrilling distinctness. The others came in all tied, ready for the scaffold. Then came the farewells — farewells with no hope of meeting again in this world! It was a moment that seemed an age of measureless sorrow. Our comrades were brave; they were soldiers, and had often looked death in the face on the battle-field. They were ready, if need be, to die for their country; but to die on the scaffold — to die as murderers die — seemed almost too hard for human nature to bear. “Pittenger, I believe you are right, now! Oh! try to be better prepared when you come to die than I am.” Then, laying his hand on my head with a muttered “God bless you,” we parted. Slavens, who was a man of immense strength and iron resolution, turned to his friend Buffum, and could only articulate, “Wife — children — tell” — when utterance failed. Scott was married only three days before he came to the army, and the thought of his young and sorrowing wife nearly drove him to despair. He could only clasp his hands in silent agony. In this manner my poor comrades were hurried off. Robinson, who was too sick to walk, was dragged away with them. They asked leave to bid farewell to our other boys, who were confined in the adjoining room, but it was sternly refused! Thus we parted. We saw the death cart containing our comrades drive off, surrounded by cavalry. In about an hour it came back empty. The tragedy was complete! ((cc) image from Jason Riedy). The next day we obtained from the guards, who were always willing to talk with us in the absence of the officers, full particulars of the seven-fold murder. When our companions were mounted on the scaffold, Wilson asked permission to say a few words, which was granted — probably in the hope of hearing some confession which would justify them in the murder they were about to commit. But this was not his intention. It was a strange stand — a dying speech to a desperate audience, and under the most terrible circumstances. This made a deep impression on the minds of those who listened, and I often afterward heard it spoken of in terms of the highest admiration. When he ceased, the signal was given, and the traps fell! Five only remained dangling in the air; for two of the seven, Campbell and Slavens, being very heavy men, broke the ropes, and fell to the ground insensible. In a short time they recovered, and asked for a drink of water, which was given them. Then they requested an hour to pray before entering the future world which lay so near and dark before them. This last petition was indignantly refused, and as soon as the ropes could be adjusted, they were compelled to re-ascend the scaffold, and were again turned off! The whole proceeding, from beginning to end, was marked by the most revolting haste. They seemed to wish, by thus affording no time to prepare for death, to murder soul and body both. Even the worst criminals in our country are allowed some weeks to ask for God’s mercy, before they are thrust into his presence; but our poor boys, whose only crime was loving and trying to serve their country, were not allowed one moment! Could the barbarity of fiends go further? That afternoon was one of deepest gloom for those who remained. We knew not how soon we might be compelled to follow in the same path, and drink the same bitter cup our comrades drank. Once during the trial we had offered to accept the award of the court in one of the cases as the sentence of all, since we could not see the slightest reason for leaving some and taking others. At that time, however, we believed that all would be acquitted. Now every hope had vanished. But even without the addition of fear for ourselves, the parting from our loved friends, whose voices were still ringing in our ears, while they themselves had passed beyond the gates of death into the unknown land of shadows, was enough to rend the stoutest heart. There were tears then from eyes that shrank before no danger. But I could not shed a tear. A cloud of burning heat rushed to my head that seemed to scorch through every vein. For hours I scarcely knew where I was, or the loss I had sustained. Every glance around the room, which revealed the vacant places of our friends, would bring our sorrow freshly on us again. Thus the afternoon passed away in grief too deep for words. Slowly and silently the moments wore on, and no one ventured to whisper of hope. Fearing they could suffer snap execution at any moment, the remaining raiders made their own hope. Weeks later, a jail breakout freed eight; all eight covered the hundreds of miles to Union lines safely. The last six, Pettinger included, were captured in the attempt and remained as war prisoners until the following March, when they were swapped back to the Union in a prisoner exchange. Strange to say, the United States at the outset of the Civil War did not have a standing military decoration. One of the fruits of this fratricidal conflict was the creation of the Congressional Medal of Honor, which remains to this day the highest honor bestowed within the U.S. armed forces. Abraham Lincoln signed the enabling legislation in July of 1862; they were minted beginning at the end of that year and formally became available as decorations on March 3, 1864. For a look at the real General in action in 1962 for the Great Chase’s centennial, take a gander at this video. The Texas is on public display at Atlanta’s Southern Museum‘s exhibit on the Great Locomotive Chase. * In the event Union forces would probe Chattanooga in 1862, but that city was only besieged in earnest and captured at the end of 1863: it was from Chattanooga that Gen. William T. Sherman launched his famous march to the sea. On this date in 1950, Taiwan’s former nationalist governor Chen Yi was shot for a dalliance with the Reds. 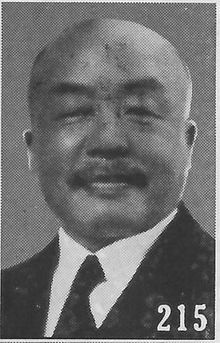 A Kuomintang officer since China’s 1920s Warlord Era, Chen Yi was from 1934 Chiang Kai-shek’s governor of Fujian province — the mainland territory directly across from the island of Taiwan. Chen had the honor at the end of World War II of accepting Japan’s surrender of Taiwan — the occasion commemorated by Taiwan’s unofficial October 25 holiday, Retrocession Day. Postwar, he became governor of that island, back before it was synonymous with nationalist China itself. His life ended in 1950, when Chiang suspected him of negotiating with the Red Chinese who had overrun the mainland. By that point, however, Chen’s political career was already history, courtesy of the most lasting of his legacies, the 228 Massacre (or more diplomatically … “Incident”). Taiwan’s new managers — the place had been in Japanese hands since 1895 — made an immediate mess after 1945. Taiwan’s productive economy was essentially siphoned for the civil war the KMT had underway against the Communists, as well as for the venal enrichment of various well-connected mainlanders who hopped over to Formosa for plum assignments that displaced Taiwan’s own local elites. Billowing inflation fed ethnic resentments, and the whole situation boiled over, as the name implies, on 2/28 of 1947. On that date, frustrations boiled over* in island-wide protests that turned to riots and even took over administration of Taipei and many other cities. Chen, on whose watch the many grievances had accumulated, suppressed those with enormous violence. Chen regained control of the situation only with considerable violence: well over 10,000 are thought to have been killed in suppression during early March, many of them executed in cold blood by mainland military reinforcements. An American who had just arrived in China from Taihoku said that troops from the mainland arrived there March 7 and indulged in three days of indiscriminate killing and looting. For a time everyone seen on the streets was shot at, homes were broken into and occupants killed. In the poorer sections the streets were said to have been littered with dead. There were instances of beheadings and mutilation of bodies, and women were raped, the American said. Two foreign women, who were near at Pingtung near Takao, called the actions of the Chinese soldiers there a “massacre.” … people were machine gunned. 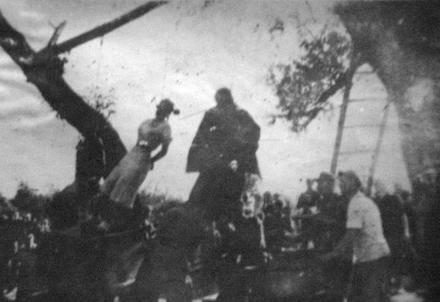 Groups were rounded up and executed. The man who had served as the town [of Pingtung]’s spokesman was killed. His body was left for a day in a park and no one was permitted to remove it. While effective in reasserting political power, this didn’t exactly bury the animosities between Taiwanese and mainlanders. It did put an end to Chen Yi’s governorship, however, since it was on his watch that things came to this pass in the first place. Given he then doubled as the author of the bloodbath, he assured himself a place of opprobrium in Taiwanese history. In 1949, the Kuomintang nationalist government fled rout on the mainland and holed up on Taiwan, implementing an authoritarian state under martial law with a running “White Terror” against dissidence, often broadly conflated with communism. Until political liberalization in the late 1980s, public discussion of 228 was strictly taboo. Today, there’s enough distance that the event is openly commemorated; indeed, Lee Teng-hui, the politician who embraced Taiwan’s democratic transition around the end of the Cold War, was himself a participant in the 228 protests. There are a variety of memorials and parks remembering 228 in present-day Taiwan … but you’d have to look very hard to find one for Chen Yi. * The specific boiling point for the protests was a violent confrontation on February 27 when state agents had seized the unlicensed cigarettes of a local peddler. The way things were going, however, there was always going to be something like this to catalyze Taiwanese anger. On this day in Kentucky in 1827, a plainly guilty murderer who was on to his third trial received an unconditional pardon. 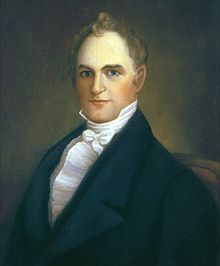 His name was Isaac Desha and his father, Joseph, was the state governor. The murder was committed in 1824. Isaac Desha had separated from his wife, who was reportedly “terrified” of him, and was staying in Richard Dogget’s roadside tavern/inn on the border of Fleming County. On November 2 of that year, Francis Baker showed up and checked himself into the inn. A newspaperman from Mississippi, he was en route to New Jersey where he planned to get married. He was well-dressed and had a lot of luggage with him. Baker wanted to visit a local man whom Desha also happened to know, and Desha volunteered to take him there. The two men set off together, Desha riding his bay horse and Baker on a gray mare, carrying two saddlebags. They never arrived at their mutual acquaintance’s home. Two hours later, a neighbor named Milton Ball noticed a gray mare, with saddle and bridle but no rider, wandering aimlessly on the highway. He caught it and was trying to find the owner when he encountered another riderless horse. This one he recognized as Desha’s. It had a saddle but no bridle. Milton Ball got his brother, who took the horse to Desha’s residence. No one was home and he left it there. As Ball was still trying to identify the gray horse’s owner, he came upon Isaac Desha walking down the road carrying two saddlebags. Desha identified the mare as his own property and took it from Ball, and they parted ways. Awhile later, Francis Baker’s saddlebags were found empty and abandoned. The man never returned to the inn. The locals put two and two together and looked warily at Desha, but there was no hard evidence of foul play and he was the governor’s son, after all, so they said nothing. That hard evidence turned up within a week, in the form of Francis Baker’s brutalized corpse — partially stripped, and hidden behind a fallen tree only yards from where Desha had been seen carrying the saddlebags. He’d been beaten with some blunt object and his throat was slit, and he had unusual stab wounds that were “four-square” shaped. Fragments of a horse bridle and a whip were recovered from the scene; Desha owned a horse whip with a heavy handle that could have inflicted the injuries that killed Baker. Desha also owned a dagger that, it turned out, precisely matched the oddly shaped stab holes in Baker’s shirt. The circumstantial evidence continued to pile up: the mare Desha had claimed as his own turned out to be Baker’s horse, and he also had Baker’s gold watch and the clothing and money that had been packed in Baker’s saddlebags. Desha claimed he’d randomly encountered two unknown men who’d sold the horse to him, and that he didn’t recognize it as stolen property, even though he’d been riding with Francis Baker only hours beforehand. As for the watch, money and clothes, Desha didn’t even try to account for those. He was arrested, and tried for murder in January 1825. The case was sensational and they had to move the trial elsewhere because the court determined Desha couldn’t get a fair trial locally. His father hired the finest defense attorney that there was, but the jury took only an hour to convict and recommended a death sentence. Desha’s attorneys immediately appealed the verdict and sentence. One of the issues was that the sheriff had stayed with the jury during their deliberations, something Desha’s defense said was improper. The sheriff had presumably watched over the jury because a number of them got anonymous notes threatening to burn them in effigy if they voted to convict. The appeals court judge, one George “Peg Leg” Shannon, agreed with the defense and overturned the verdict. The fact that he was good friends with Desha’s father the governor had nothing to do with it, he said, and the outrage among the citizenry and angry editorials in the newspapers would never make him admit otherwise. Desha got his second trial in September 1825 and got convicted and sentenced to death again. Once again the case was overturned on appeal, this time because the prosecution had not proved Francis Baker’s murder took place in Fleming County like the indictment said. But there was nothing to be done about it: Desha would have to be tried a third time. He was, in February 1826, well over a year after the murder, and the third jury convicted him too. Desha despaired over his third conviction and attempted suicide in July of that year, slitting his throat in his cell. He very nearly succeeded, and the surgeon who brought him back from the brink had to put in a silver tube to reinforce his severed windpipe. For the rest of his life he could speak only in a whisper. The tube needed to be removed regularly for cleaning, and every time this happened Desha endured a terrible feeling of suffocation. whereas the whole of the evidence against the said Isaac B. Desha being circumstantial, and from much of it being irreconcileable, I have no doubt of his being innocent of the foul charge; therefore is an object worthy of executive clemency. Given under my hand at Frankfort, on the 18th day of June, A.D. 1827, and in the 36th year of the Commonwealth. Desha’s murder conviction was once more under appeal, but his suicide attempt had left him in such poor health that a sympathetic doctor signed an order saying keeping him in jail was endangering his life. He was released on bond pending the outcome of his appeal. Request denied again, and what’s worse, the court decided Isaac Desha’s health had improved enough that he could withstand the rigors of jail. He was remanded into custody. Governor Desha still had one last card up his sleeve, and it was a trump. On June 18, the same day Isaac was ordered back behind bars, his father rose in court and issued him an unconditional pardon on the spot. Joseph Desha committed political suicide when he pardoned his son. Isaac’s crime, and the obvious favors afforded him by the justice system, severely damaged the governor’s reputation. Contrary to popular belief, Joseph didn’t resign after pardoning his son. He quietly finished out his term, retired to his farm and never entered politics again. He died in 1842. As for Isaac Desha, there’s a legend that he moved to Honduras or Hawaii and has descendants still living there. In fact, although he did head west after his release from jail, he never made it further than Texas. Like a lot of pioneers, he surely hoped he could put his former troubles behind him. But Isaac Desha carried trouble with him: in Texas, he allegedly robbed and killed a fellow traveler in a crime remarkably similar to Francis Parker’s murder. He was charged with murder yet again and this time he didn’t have an influential father to protect him. Desha escaped the death penalty one last time, though, by dying of a fever on August 13, 1828, the day before his murder trial was supposed to start. He was twenty-six. It’s at dawn on this date in 1800 that the republican Mario Cavaradossi is shot at Castel Sant’Angelo in the climax of the Puccini opera Tosca. This opera was adapted from the play La Tosca, by Victorien Sardou. That author does this site the considerable favor of exactly dating the action; a character at the end of Act 1, Scene 1 announces, “this evening, 17 June, a celebration at the Palazzo Farnese in honor of this victory.” The remaining story unfolds over that night and into the next morning. 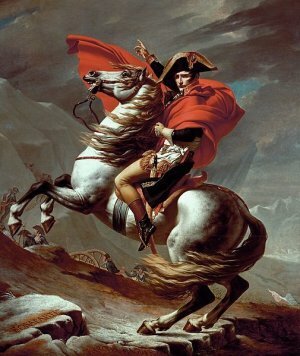 En route to Marengo: Jacques-Louis David‘s heroic picture of Napoleon crossing the Alps comes from this campaign. “This victory” worth the proposed palazzo party is the Austrian defeat of Napoleon at the Battle of Marengo during Bonaparte’s 1800 invasion of Italy. But there’s a minor problem. Said seesaw battle went not to Austria but (decisively) to Napoleon, after a late French rally. The action of Tosca takes place in a Rome which has received an initial, incorrect notice of Austrian victory. This is of particular import in the Eternal City because it’s under the temporary receivership of the Hapsburg Queen Maria Carolina, a virulent foe of the French Republic as befits a sister of Marie Antoinette. Our date’s fictional principal would reckon among those. We meet him as a painter with subversively liberal inclinations, in love with the titular heroine as she with him — but opposed by police chief Scarpia: his profession is to pursue revolutionaries; his passion, to pursue Tosca. And because Scarpia is a villain, he arranges for his rival’s “mock” execution to be not so mock after all … to the suicidal horror of Tosca. There are scads more Tosca excerpts on YouTube. Here’s an Italian-English libretto, and here a handy summary. * It would, in fact, happen again. ** Okay, to agree to yield herself to him. Tosca stabs Scarpia to death when he rises to collect her promised virtue. † “In the manner of Count Palmieri,” Scarpia instructs his subaltern. If this is a reference to a real case, we are not aware of it; there was a royalist Marquis Palmieri executed in Naples in 1807 by Napoleon’s brother, Joseph. A few hours ago as of this writing, the U.S. state of Utah put Ronnie Lee Gardner to death by firing squad, a method so vintage that its constitutionality was challenged in the 19th century. He’d spent a lifetime in the clutches of various state institutions, and shot a lawyer dead in an audacious attempt to break out of a Salt Lake City courthouse while shackled. That happened way back in 1985. A quarter-century later — full half a lifetime, for Ronnie Lee Gardner — the clock finally ran out on the resulting legal process. Gardner fought the execution to the very end, his plea for executive clemency (backed by some of the jurors who doomed him, and by some relatives of the murder victim himself who claim that Michael Burdell opposed the death penalty) falling on predictably deaf ears just a few days ago. But Gardner did volunteer, if he had to die, to die that headline-grabbing, reminiscent-of-Gary-Gilmore death at the business end of an anonymous five-man team of marksmen. 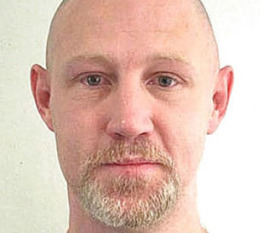 With the execution of that procedure minutes after midnight today, Gardner became the first U.S. prisoner executed by firing squad since John Albert Taylor in 1996. He might ultimately be the last ever … though a few inmates still residing on Utah’s death row might yet supplant him. On this date in 1975, a Saudi prince knelt in the public square before Riyadh’s Great Mosque, and 10,000 onlookers watched a golden-hilted sword took off his head for regicide. It is little enough to say that, twelve weeks before, Faisal ibn Musa’id (transliterated several different ways — ibn or bin; Musa’id, Musaid, Musaed, or Musad) had approached his uncle King Faisal and shot him three times at point-blank range. The reason(s) why a prince of the realm should do such an extraordinary thing are the real issue. They were murky then, and remain so to this day. Certainly, when the monarch of the world’s leading oil producer is slain shortly after denying his product to the world’s leading oil consumer … well, speculation is bound to happen, even if the oil embargo was wrapped up a year before the murder. The assassin had studied (lackadaisically) in the United States a few years before, fueling hypotheses of a CIA hit, but there’s not even much of a satisfying just-so story to go with that, to say nothing of supporting evidence. The prince’s brother Khalid (or Khaled) had been slain by Saudi Arabia’s security forces in 1965 after demonstrating against television’s entry into the kingdom, an innovation authorized by King Faisal to the chagrin of strict Wahhabists. Khalid remains a martyr figure to Islamic fundamentalists to this day, and the conventional supposition is that Prince Faisal shot King Faisal in vengeance served 10 years cold; some accounts have him announcing as much at the moment of the murder. The official inquiry concluded, as such things do, that Faisal killed Faisal alone, and though early reports had the shooter mentally unbalanced, authorities eventually figured him sane enough for trial and the full measure of the law’s majesty. Faisal ibn Musa’id remains the only royal prince judicially executed by the House of Saud. * An assassination inspired by Faisal’s shows up in the second novel of the cycle, Trench.